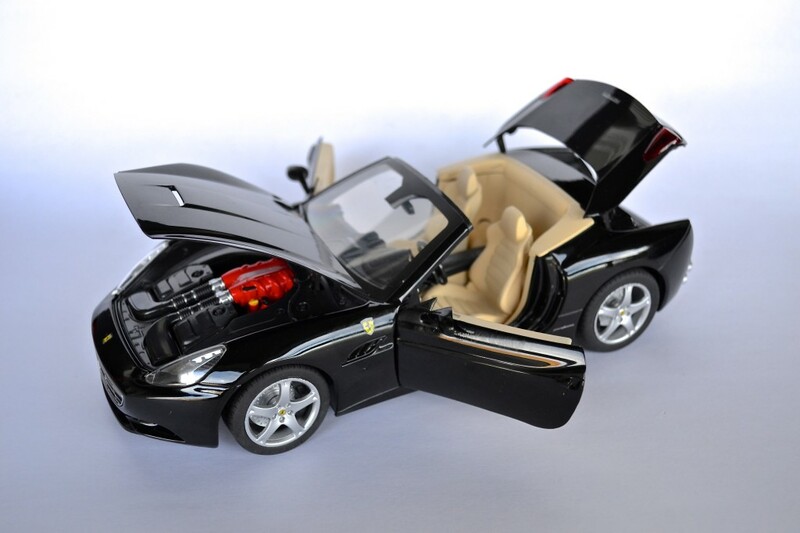 Just as promised, I am going to review the Ferrari California. Please read this carefully before you scroll down! This review is going to be done in four parts. 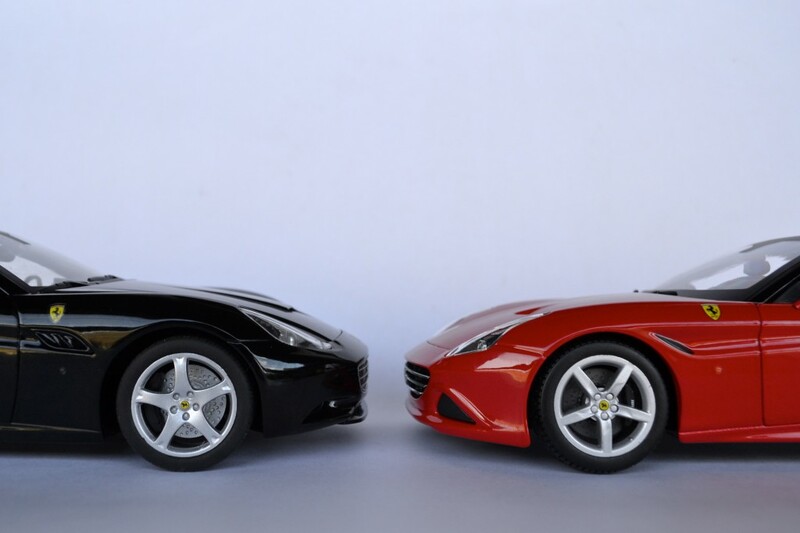 Not only as a review, but also as a comparison between the new Bburago models and the Hot Wheels models. Some people are not going to like some of what they read. Other will not agree with some things. Either way, I am going to try to be as objective and neutral in this review/comparison. Any opinions, questions or arguments are more than welcome, as long as we keep it civil. I will attempt to do the most in depth review I have ever done before, going into some details that I never cared about (and I still don’t), but based on my experience on the forums, some people are actually interested in. In this first part I will just start with the generic stuff and compare things like packaging, weight, dimensions and overall looks. I personally never cared for the packaging of the model. To me it made no difference if a model comes in a mahogany handcrafted box or wrapped in paper, as long as its packaging protected it. I take all my models out of their boxes (yes the resin ones too) and the boxes are stored by themselves elsewhere. However, I have seen many times people make a big deal about the box, even as far as justifying resin models’ price with the fancy packaging. So i decided to include this in the write up. Both models come in a glossy cardboard box of generic type and both are bolted down to a plastic base. I have used the packaging from the Hot Wheels Foundation LaFerrari on purpose (and I was too lazy to go dig up the Cali one). Most will be familiar with what this package looks like and the long four bolts that screw the model to its base. The Bburago box is very similar, but far superior in my opinion, for a couple of reasons. First it uses the signature two screws down the center line to secure the model. HOt Wheels models are plain pain removing from the base. Not a big deal for me, but ask my 9 year old how he feels about it. LOL. The other reason is practicality. And this is important. Because it affects cost. 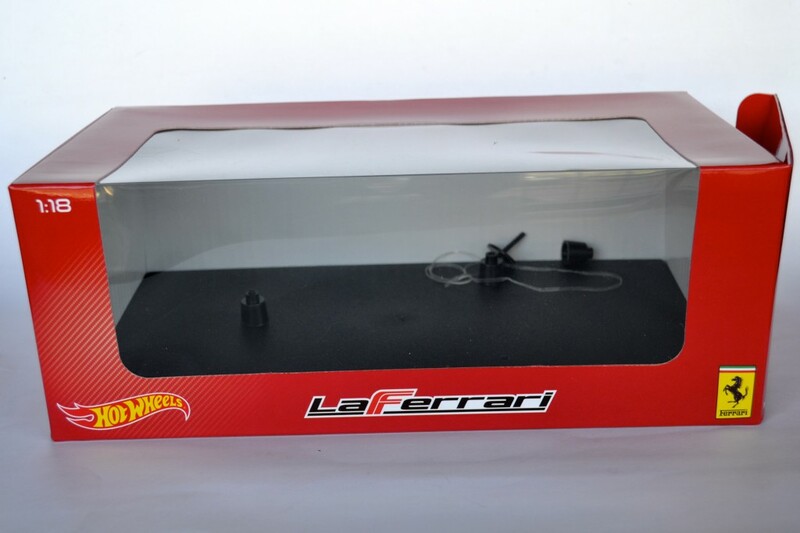 It is a generic Ferrari box with advertisement of other models from the collection on the back. 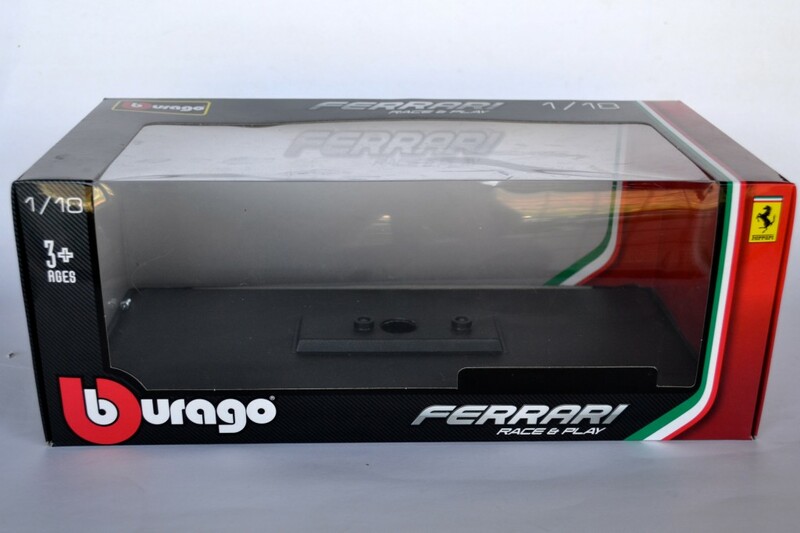 That means that Bburago have made a standard box for every model. the bases and the screws are also standard and needless to say this is a lot cheaper way to go. What this means to us is, lower prices and more money for development. Both boxes are pretty much identical size. Another thing that I never cared about was the weight of a model. Some people like the heavier feel of a model so much, that they are willing to pay $500 for inferior model just because it felt heavier in their hands. I am not going to argue the logic, just can’t understand it. But because of it, I weighted both models. The Bburago feels substantially heavier and more solid. 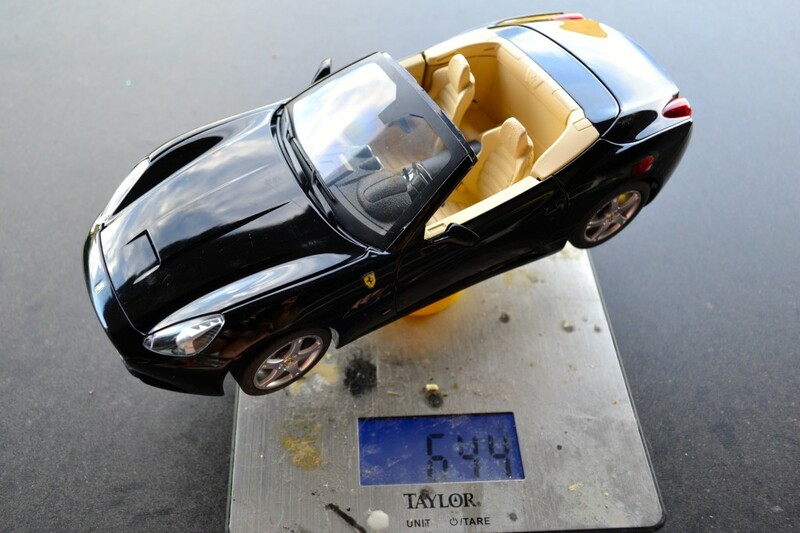 774gr for the Bburago vs. 644gr for the Hot Wheels. 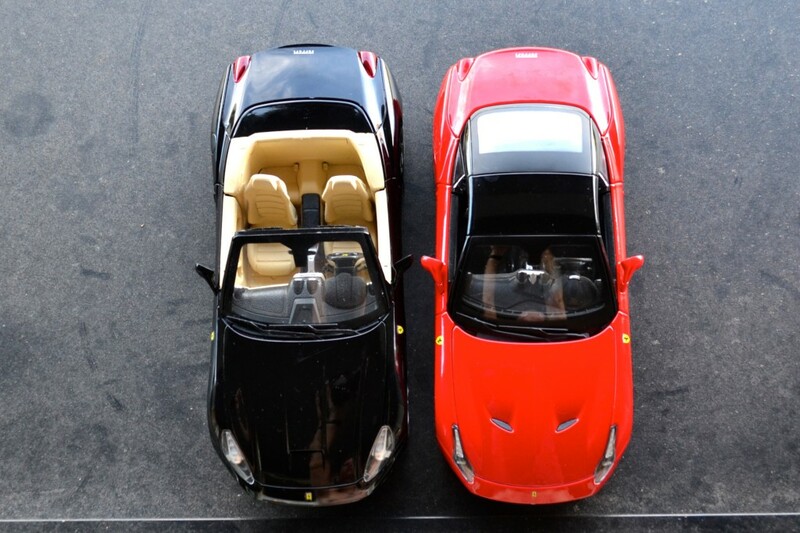 Both cars come in a small selection of traditional Ferrari colors. The cool thing about the Hot wheels model is that it comes with a removable roof, while when buying the Bburago you have to chose between open top or closed. Both cars have similar functions. Both doors open, both hoods open and the steering turns the wheels. they both have disc brakes that rotate in the calipers. The Bburago model has spring loaded “working suspension”. I personally, am not a fan of this kind of set ups, but on the bright side, it makes lowering the model easy. The Hot Wheels model has a solid rear axle, which means the rear wheels rotate together, while the Bburago ones rotate individually. This is really tricky. I don’t know if anyone has seen it, but years ago (close to ten) there was a really nice interview with one of the main designers working for Kyosho. In it he gave some great insight into how models are designed and what it takes to make a high quality replica. He was specifically talking about dimensions and how you can’t transfer them to the model by simply dividing the 1:1 measurement by 18. Because when in scale the size of the car play tricks to the eye. In other words, manufacturers change some measurements for the sake of more proportionate looking model in scale. 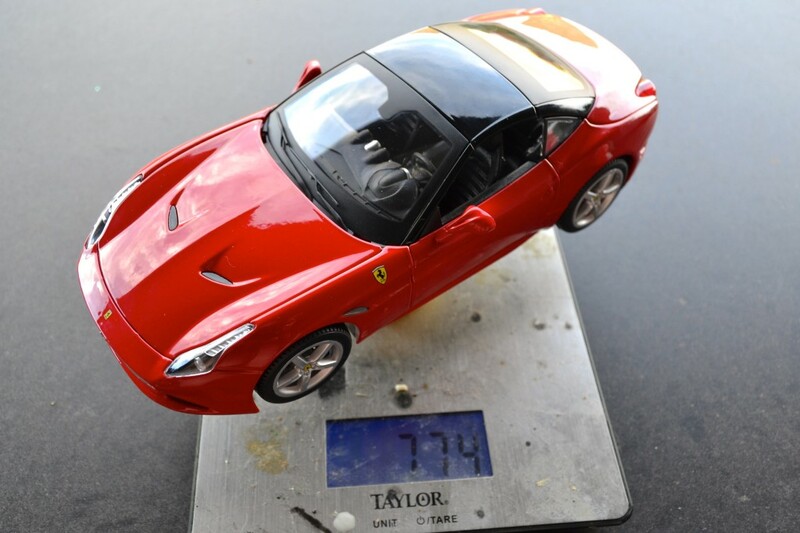 When you measure the two models, the Bburago is definitely shorter, with shorter wheel base. This is something that becomes evident only when you put the two models side by side and even then the difference is so small that it is not really noticeable. Ride height is the same and although the red Bburago Cali looks lower, it is actually taller. Just as in 1:1. When measured, both models are technically inaccurate. The Hot Wheels Cali is is a touch longer that exact 1:18 scale, with a wheel base that is almost perfect, but narrower than it should be. The Bburago California T is shorter than it should be with shorter wheel base, but nails the width. So what does all this means? Well, not much really. Although the Hot Wheels model is technically more accurate measurement wise, the Bburago is more properly proportioned. But over all both look good and going into 2mm differences is “rivet counting” and “splitting hairs”. However, there are two more things to consider without going into details. First, the Hot Wheels California has plastic doors and hoods, while the Bburago is all metal. Second, and this is the big deal, is the price and availability. To be fair, I am comparing not the going prices, but the MSRP. The Hot Wheels Foundation California retailed for about $70 many moons ago. In contrast, the Bburago model retails for $35, which is amazing considering how everything has gone up in price, since Hot Wheels introduced their model. 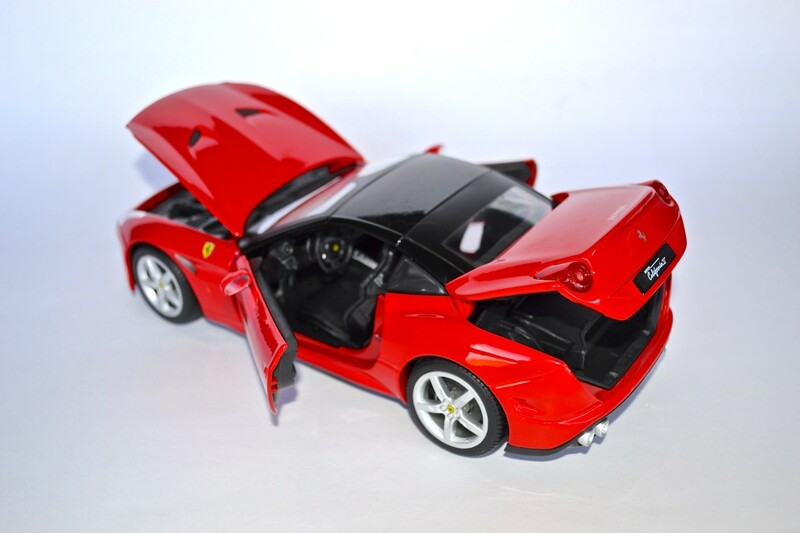 5 Responses to "REVIEW: Bburago/Hot Wheels Ferrari California – Part 1"
Interesting review so far. Looking forward to Part Two. 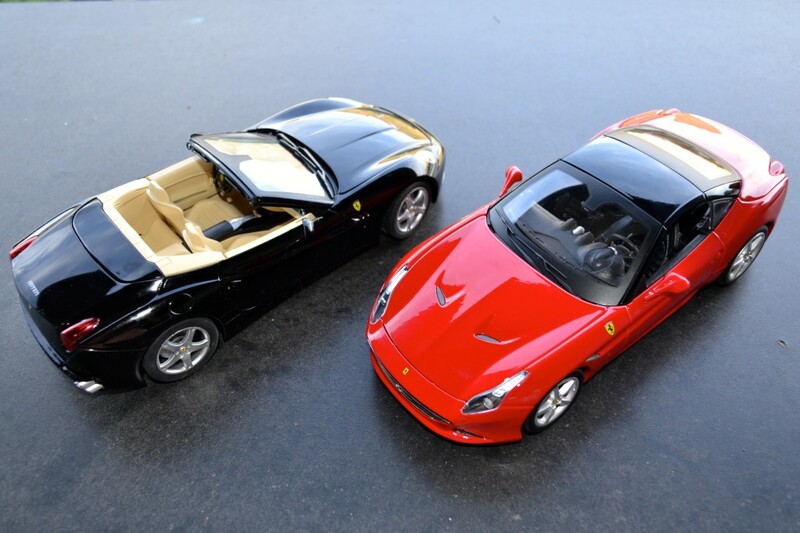 The black is the old model (California) and the red the new one! Maybe is this the reason about the dimension? Hey! Great review. Can’t wait for Part 2. Just one question. 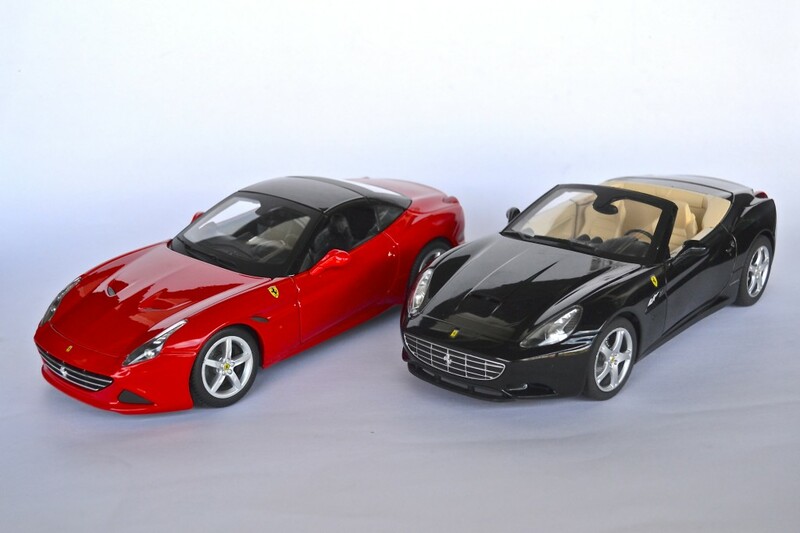 Is that black HotWheels 1:18 Ferrari California you are using for the comparison a ‘Foundation’ or an Elite?